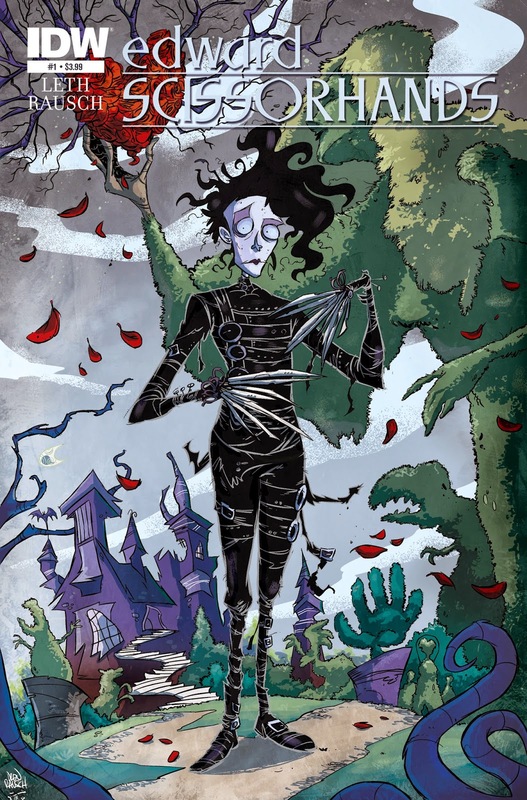 Since everyone else was reading comics and graphic novels this month for Comics February, I picked up the one trade book that I had sitting on my TBR shelf, Edward Scissorhands, Volume 1: Parts Unknown, written by Kate Leth and drawn by Drew Rausch. The story in this takes place after Kim dies of old age. Her granddaughter has always believed her version of things, namely that Edward was a gentle soul and not a murderer. She finds Edward up in his home having a bit of a crisis -- he has brought back to life one of the Professor's failed experiments and it has turned out to be quite evil. I really liked the story in this volume. Edward's innocence and tentativeness came through even in this format. I also liked the artwork for the most part except that I don't quite like how Rausch draws faces (everyone is ugly and/or making ugly faces) and a few of the panels were hard to decipher. But he has just enough Tim Burton in there to make it appealing and I did like his artwork more than almost all of the alternate covers that were included in the back. Volume 2 came out last October so I'll be picking it up sometime soon!